A new store recently popped up on our radar at Syracuse mega shopping, dining and entertainment complex Destiny USA, so last Saturday my dear wife Karen and I stopped our stroll to drop in and take a look. 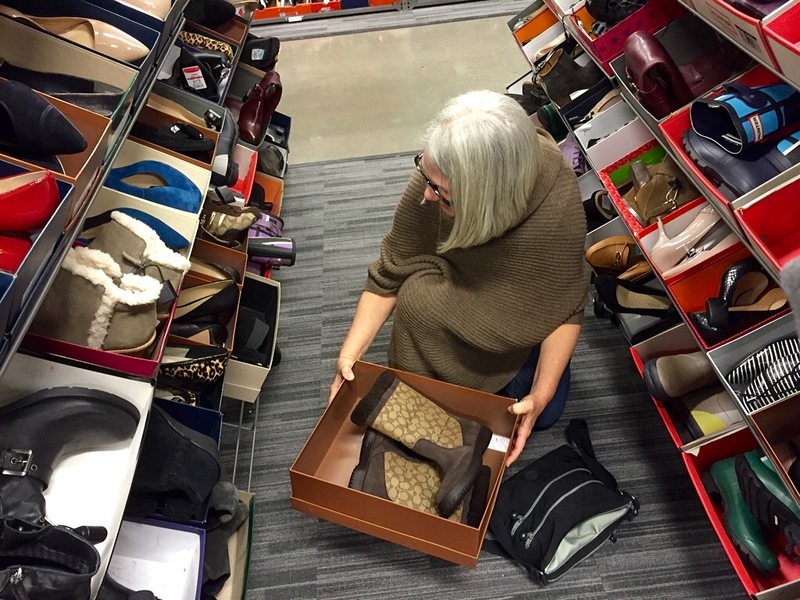 Nordstrom Rack promised big deals on great brands. So said the sign out front. Hover over either gallery photo for a description. Click on either for an enlarged slide show. The store certainly was huge. I noticed right away, however, that the men’s department was way smaller than the women’s department. I also stopped browsing quickly after discovering what Nordstrom declared as discount pricing. A pair of boots on the rack caught Karen’s eye. I agreed that they were pretty smoking. Price tag, reduced way down to … $99.97. Back on the rack they remained. I’m stuck in another decade price-wise. Or just not a Nordstrom Rack kind of guy. If you discount shop, what stores do you frequent, and why? What’s the best deal you’ve gotten lately, and why do you think so? What have you purchased damn the price, and not regretted, and why? How cold is just too? Wow! I would hate to see what the before discount price is. Yes. That would make me go even more pale, PJ! Me too! I would avoid that store at all costs. LOL! Yes, they are trying a hook for new eyes, Gatorette. You are right about that. 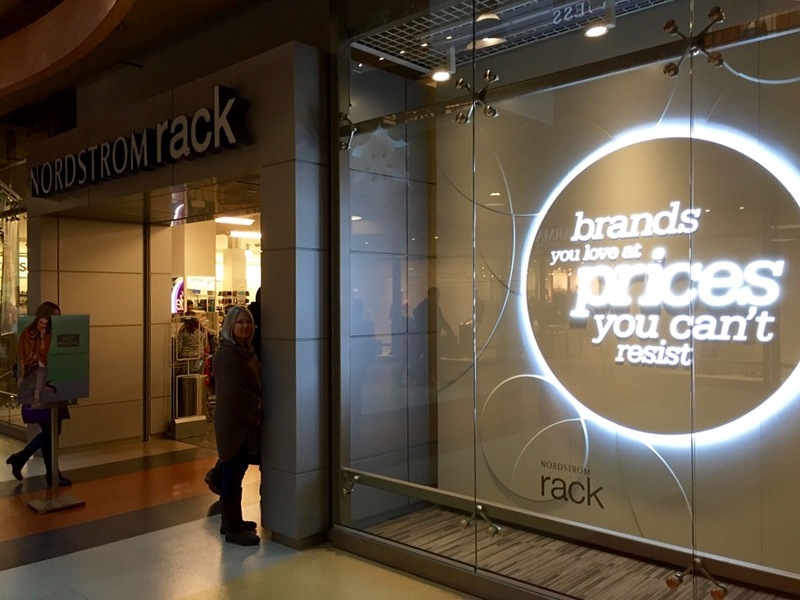 We’ve had Nordstrom’s Rack for a long time – I never bother to even go in there. I do better at Target. However, I did recently succumb to an impulse purchase at The Bon-Ton. As I was rushing through the store to the escalators, I saw pair of waterproof knee-high boots on sale for just $99. Just for kicks (pardon the pun), I tried them on – perfect for muddy walks in the back yard in spring. So even though I normally would never spend that much for a pair of boots (rain boots, at that), I went ahead and got them. Only after I got home did I notice they were made by Ralph Lauren (must have been part of the “slumming” line). I must say, though, that I have never once regretted the purchase – they are the best boots I’ve ever had. I put your Lauren lawn boots in the category of Treating Yourself, CM, and you deserve it. That’s not a price thing, that’s a work-hard thing. It’s great to find awesome deals like that. Nordstroms is a pretty good store from what I hear. Too expensive for me, Tony. But nice stuff, for sure.